DWL041 . Released May 2004 . Add to Cart : $10 . 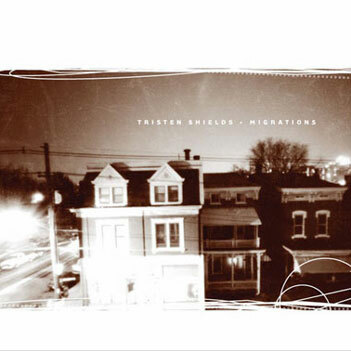 iTunes Music Store Description Migrations is the debut full-length from Cincinnati-based singer-songwriter Tristen Shields, expanding on the hushed folk intimacy of his live performances with a palette of synths, strings, and experimental flourishes. Produced with electronic artist Michael Bond (Coltrane Motion), the disc attempts to fuse Shields' dual loves of organic folk and electronica with a flurry of crackling beats and acoustic strumming, held together by the emotive sincerity that's been his trademark. Reviews Duality is explored here via the intelligent merger of electronica and traditional, organic, acoustic folk. The beats are static-ridden and pulse with a tempting delightful amusement all their own. While most electronica is void of pure emotional feeling with its cold harsh beats, Tristen Shields eschews raw emotion and covers all the ranges with his guitar strumming. But the guitar and electronic work aren't the only interesting instrumentation present here, you've also got the enchanting cello, xylophone, and Wurlitzer. Inspiring yet never pretentious, 'Migrations' is indeed an album of two ages. Nick Drake has new competition in the Sunday morning hangover rotation. Tristen Shields sounds like he's been handed a solitary guitar and told to imitate the sound of Massive Attack, and the result is as blissfully mellow and atmospheric as you'd expect: just slow folk strumming and a guy singing in his sleep.